Shrub or multi-stemmed small tree up to c. 3 m tall. Branches rigid, squarish and twisted, armed with short spines. Leaves in opposite clusters on small woolly spurs, sub-sessile, simple or rarely 3-foliolate, narrowly oblanceolate, 2-5 cm long, grey-green, mostly hairless when mature; apex rounded to notched; margin entire. 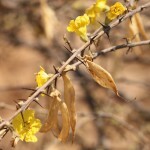 Flowers appearing with the leaves, showy, golden yellow, 2-4 cm in diameter, petals wrinkled along the edges, solitary or in few-flowered clusters among the leaves. Fruit a flattened slender capsule, c. 7 × 1.2 cm, light green to pale brown with a sharply pointed tip, dehiscent. Derivation of specific name: brevispinosum: with short spines. Habitat: In dry scrub and open woodland, on sandy soils or limestone rocky outcrops. Worldwide distribution: Angola, Botswana, Namibia, Zambia, Zimbabwe, Northern Cape and Limpopo, South Africa. Coates Palgrave K. (revised and updated by Meg Coates Palgrave) (2002). Trees of Southern Africa 3rd edition. Struik, South Africa Page 1008. Curtis, B.A. & Mannheimer, C.A. (2005). Tree Atlas of Namibia National Botanic Research Institute, Windhoek Pages 590 - 591. (Includes a picture). Diniz, M.A. (1988). Bignoniaceae Flora Zambesiaca 8(3) Pages 67 - 68. Kirby, G. (2013). Wild Flowers of Southeast Botswana Struik Nature, Cape Town South Africa Page 152. (Includes a picture). Phiri, P.S.M. (2005). A Checklist of Zambian Vascular Plants Southern African Botanical Diversity Network Report No. 32 Page 36. Roodt, V. (1998). Trees and Shrubs of the Okavango Delta Shell Field Guide Series: Part I Shell Oil Botswana, Gaberone. Pages 60 - 61. (Includes a picture). Van Wyk, B. & Van Wyk, P. (1997). Field Guide to Trees of Southern Africa. Struik, South Africa Pages 120 - 121. Van Wyk, B. & Van Wyk, P. (2013). Field Guide to Trees of Southern Africa (Second edition) Struik, South Africa Pages 134 - 135. (Includes a picture). Bingham, M.G., Willemen, A., Wursten, B.T., Ballings, P. and Hyde, M.A. (2019). 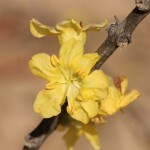 Flora of Zambia: Species information: Rhigozum brevispinosum.